Last edited by Abbas Ali on Wed Sep 27, 2017 3:10 pm, edited 1 time in total. TLD and Timsan met bidding conditions. TMX-450-50 by TLD - evaluated cost 320,000/- euros. TMX 550-55 by TLD - evaluated cost 350,000/- euros. Challenger 430 by Trepel - evaluated cost 324,700/- euros. DC12-44-400 by Douglas - evaluated cost 347,900/- euros. Lowest evaluated bidder: TLD 320,000/- euros for TMX-450-50. The TMX-450 Aircraft Towing Tractor, with a maximum driveline capability of 32,000daN (70,500lbs) is designed to perform push back and towing operations on medium and wide body aircraft (like the B767, A300, A310, A330, A340 up to the 500 and 600, B777, B747, A380.). Its ergonomic design provides maximum driver comfort and increased visibility. TLD’s high standards of build and component quality make the TMX-450 a durable and reliable tractor. According to Abb Takk news channel, six AC Vans for PIA have arrived in Pakistan from USA. The vans will be distributed to airports of Islamabad, Karachi and Lahore. In the past there were incidents in which a number of passengers in the aircraft began feeling unwell due to poor performing AC Vans, according to the news channel. Karachi; March 26, 2017 - CEO PIA, Bernd Hildenbrand visited the Ramp Services and Food Services divisions of the airline here this afternoon. Talking to senior PIA management on this occasion the CEO expressed the satisfaction that during the last one year PIA has added 24 new GSE which include AC vans, baggage belts, ambu-lifters and hi-lifters, while four Ground Power Units are on their way. In addition, renovation of old equipment is also being done using airline's indigenous resources. During the visit he inspected the Ground Support Equipment (GSE) and passenger transport vehicles refurbished by PIA, using indigenous resources, saving millions to the airline. He said an airline is not only the aircraft and ground equipment is its integral part but unfortunately PIA's current ground equipment is mostly over 25 years old and no investment was done for many years. That is why, he said, it is very important that all existing equipment is taken good care of so that it serves the airline well in the months and years to come. The CEO was pleased to note that a lot of improvements have been brought about in the working of these divisions. He said work is being done in the right direction but there's still a long way to go. Mr. Hildenbrand asked the management to ensure improved efficiency in their respective departments, particularly focusing on cleaning and maintenance of ground support equipment. He also visited different areas of maintenance facility. The CEO particularly appreciated the steps taken in the Catering division during last one year to organize its work and to ensure cleanliness of premises and hygiene of food. Procurement of nine new baggage trucks. 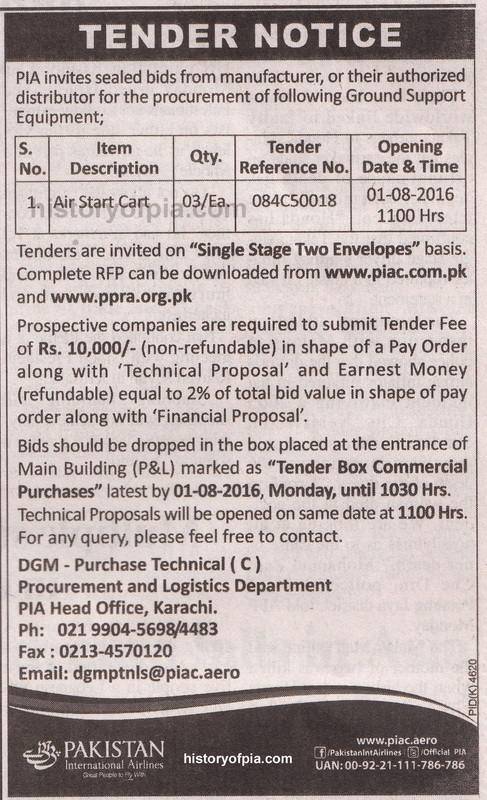 PIA bids invitation in June 22 newspaper for the procurement of new Ground Support Equipment (GSE)/vehicles. CTV CHO - cho.co.th - of Thailand qualified for hi-lifters. Refurbishment of three high lifters (vehicle serial numbers 1601, 1602 & 1614) at Karachi Station. Refurbishment of one high lifter (vehicle serial number 1593) at Islamabad Station. For Aircraft Tractor Trepel (trepel.com) is the lowest evaluated bidder. For Passenger Coaster COBUS Industries (cobus-industries.de) is the lowest evaluated bidder. For Cobus 3000 (http://www.cobus-industries.de/en/produ ... -3000.html). For Ground Power Unit (GPU) TLD (tld-group.com) is the lowest evaluated bidder. For Air Conditioning Unit (ACU) TLD (tld-group.com) is the lowest evaluated bidder. For Air Start Cart TLD (tld-group.com) is the lowest evaluated bidder. For Baggage Belter TLD (tld-group.com) is the lowest evaluated bidder. For Ambulift/Medical Lift Mallaghan is the lowest evaluated bidder. For Passenger Coaster/Minibus, Golden Dragon model XML6722J18 (goldendragonbus.com) offered by VPL Limited (vpl.com.pk) has been selected.